When I was not confiscating contraband items from school children this week I started to look into some quilt competitions for The Ostrych. I sent off my registration for Festival of Quilts just in time for the deadline then studied the requirements for Houston. The IQA show is juried but if successful, the quilts would have to be in Houston in mid August when FOQ is in full swing. I considered entering 4 quilts to each show and renaming each set of four a “Quostrych” but when I laid them all out it bothered me that they are all slightly different sizes. 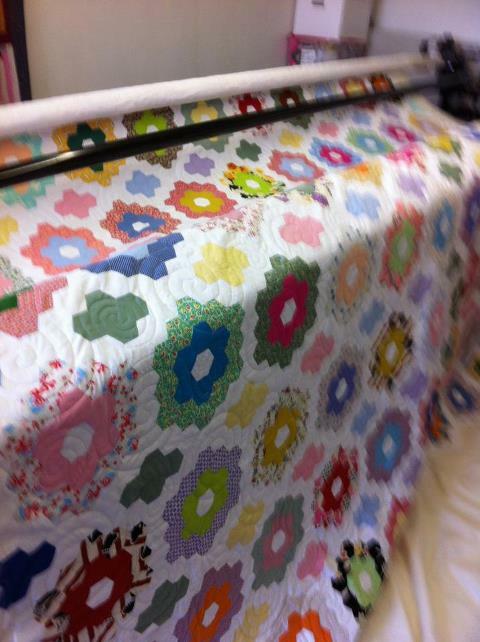 I think I can get away with this with the full set of 8 but 4 slightly different sized quilts seemed odd. I have decided that the answer is going to be to make 3 new pieces that are all of the same size for Houston and enter a conventional Triptych. 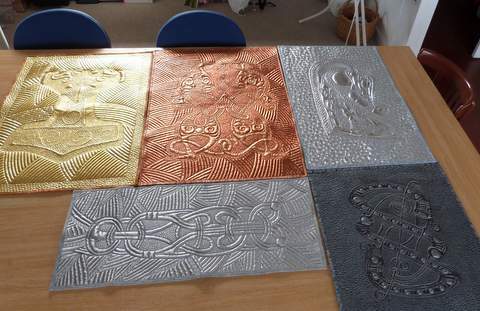 All I have to decide now is whether to make 3 identical pieces in different coloured shiny fabrics or create 3 entirely new quilted carvings. If they don’t make it into the show then I will have some items that I can sell to help fund a quilty trip. Alternatively, I have the germ of an idea developing… perhaps I should just work my way steadily through the periodic table but not necessarily to a self-imposed ridiculous deadline. It would be like a Norse Saga that keeps growing over time. I am frustrated that some of my projects are still on the back burner because I have not managed to clone myself yet. The Totem Poles and the Armoured Horse seem to have been mothballed for now and my Australian version of Bewitched is no further forward, and Freya’s giant hexagon quilt is still in pieces. I have a few customer quilts to catch up with and there is a steady stream of supply teaching taking me out of my workshop for at least 3 days each week. 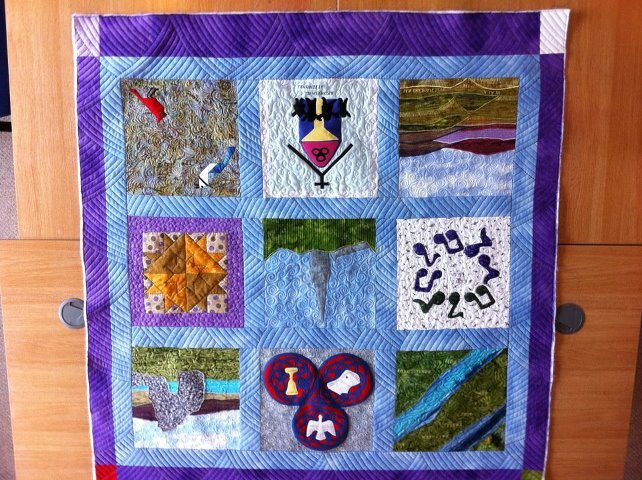 I completed a quilt for a customer who had made her Church Minister a special retirement wall-hanging. I had a great day in Fochabers teaching a group from Speyside Quilters my Wild Wholecloth Workshop which they all seemed to enjoy. They worked very hard to burn off the wonderful pavlova and fruitcake that was served with coffee. I was also side-tracked by helping Fergus with his guitar practice looking up chord demos on Youtube. Admittedly, I have been occupied obsessively restoring my blog on WordPress – using old notebooks to rewrite missing pieces and tidying up the photos and text so that it all looks more cohesive. I really don’t suppose that many readers will want to trawl right back to the beginning but looking back has been a fascinating experience for me. My quilting life remains as chaotic as it ever was but it is interesting to see how ideas formed, developed or were simply abandoned. I seem to have written rather a lot in 4 years; almost 110 000 words actually! I have noticed that other bloggers don’t seem to ramble on quite like me. I simply need to apply the same discipline to writing patterns and I will soon deal with The Book that is constantly looming over me like an albatross. Since I have been on a roll with the Norse series, I made an effort to crack on with quilting the piece that looks rather like seaweed. The brown taffeta looks amazing outside in the sun, just like a piece of polished bronze or maybe iron which is just what I had hoped. I bound this one and the blue piece so that I am not left with a marathon session at the end. It will be bad enough attaching 8 hanging sleeves and labels. I intend to add some embroidery stitches or couch something sparkly down all of the bindings as a finishing touch later on. My sewing machine went on strike again after Norse Piece #7 but after I cleaned to fluff, and paint dust out of the bobbin case it decided to co-operate once more. Amanda visited on Wednesday for another session of longarming tuition. 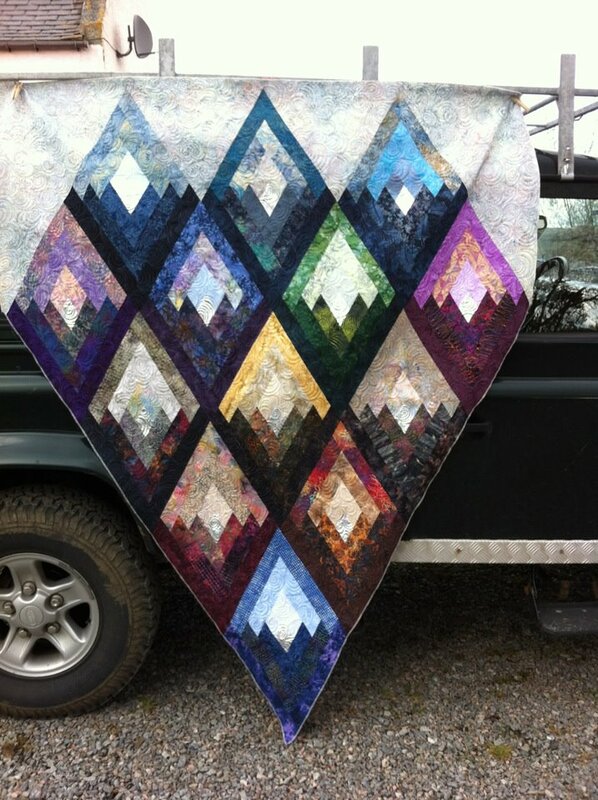 She had bravely decided to longarm quilt a huge hand-pieced hexagon quilt and because she was limited to one day in the studio she chose to use the large spiral continuous template. She was delighted by her efforts, especially since the beautiful quilt top had been folded up in a cupboard for some time. She will eventually turn in all of the many edges by hand instead of cutting off the hexagons! I taught 5-6 year olds for two days and they enjoyed working on dramas of the cannibalistic story of Hansel & Gretel. Some of the children wanted non-speaking parts as the witch’s cat but they were very good at loud purring and miaowing. They loved the part where the witch gets shoved into the oven but they let her out before she was cooked alive as long as she promised not to kidnap any more children. If I had been the supply teacher for the class for a few more days it would have been fun to construct the gingerbread house. I had a really positive business discussion with APQS over the weekend and I am excited that I will be working alongside Claudia Pfeil in Ireland at the new International Quilt Festival in June. I have been plugging away at restoring as much of the Blog as possible to WordPress by trawling my computer’s archives for Word documents and photos back to late 2008. By the end of next week I will have put back as much as I can including an entry about our family holiday to Carcassonne in 2009 that had disappeared completely from the computer. Luckily I found the original handwritten notes in ink in a real notebook with pagesJ. When this laborious exercise is complete I will print the entire blog. It has been funny looking back at all of the entries over the past 3+ years. I continuously seem to be looking for more time and trying to fit far too much in. It is also interesting to look back at my progress and reflect on how ideas such as the Yurt project developed. 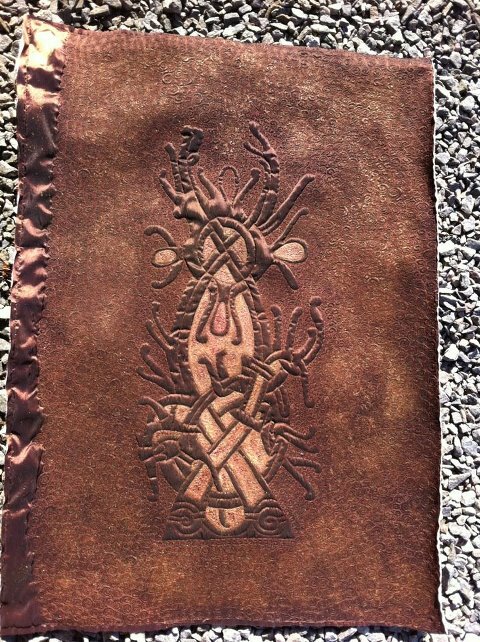 Over the weekend I quilted the eighth piece in the Norse metallic wholecloth series. The tissue lame was not easy to work with even after adding some thin Vilene; there are a couple of tiny creases that I will have to ignore or disguise. I have been playing around with ideas for the title of the series: I figured that since a three piece quilt is called a TRI-ptych then an eight piece quilt could be called an OCT-pytch. 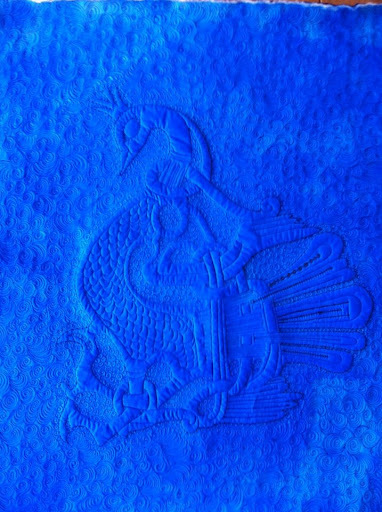 I was amused that sounds similar to OSTRICH so perhaps my Norse quilts could be known collectively as an OS-(p)t(R)ych? I wondered if that was really a convincing enough reason for the unusual title so I consulted Wikipedia and was delighted to discover among the various definitions that “Os” can mean an Anglo-Saxon pagan god in the Old English language – this seemed appropriate for some of the strange carvings of Viking figures that I have been quilting. Therefore, the series is going to be known as OSTRYCH and the individual pieces will be known by their metallic symbol from the periodic table. I need to try to stick to metals that the Vikings would have had. Copper, iron, lead, tin and gold are obvious but I will have undertake research to find out whether I can have titanium or cobalt for the blue piece. If not I will have to convince myself that the Vikings were able to trade overseas for some of the foreign metals! We had a great family holiday in Edinburgh, travelling by train from Stonehaven. There were times when the children wished we had taken the car as they are not used to walking for long distances on pavements. We stayed in a new Premier Inn on Princes Street with a fantastic view of the Castle and of the chaotic roadworks in the street that represent the controversial and hugely expensive Edinburgh Tram Project. 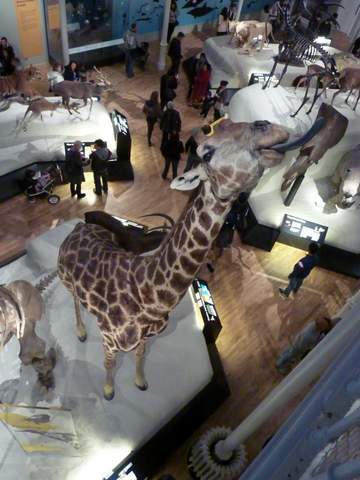 We visited the revitalised National Museum of Scotland with its amazing Natural History gallery. Everyone reached knowledge saturation point after a while so we left without having seen absolutely everything. We made a fleeting visit to the National Gallery before the children had a cultural meltdown. They were not particularly impressed by the sculptures at Contemporary Art Gallery which did not have any of its famous paintings on display. Freya even muttered that she wished she had chosen Biology instead of Art when we tried to understand the significance of what looked like worktop samples from a DIY shop. 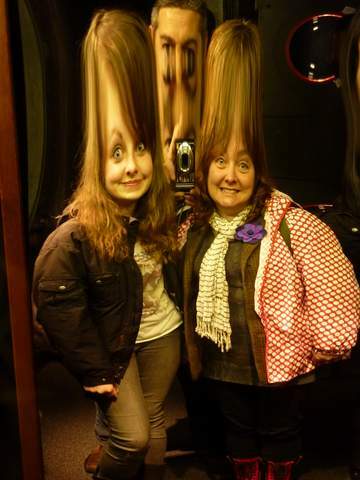 The Camera Obscura Museum was great fun: there were optical illusions, crazy mirrors and weird holograms. This was followed by a visit to the Museum of Childhood which housed a huge collection of evil looking dolls. I think we found them more disturbing than a trip to the Edinburgh Dungeons where actors recreated scenes from a medieval cannibal cave and the dastardly deeds of notorious body-snatchers, Burke & Hare. 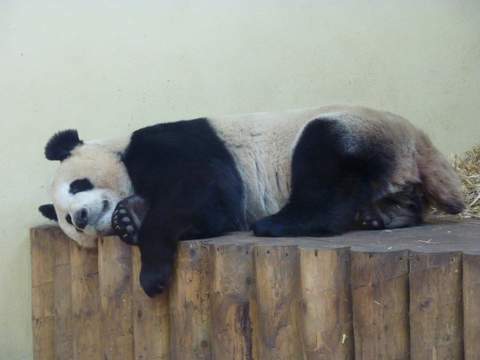 A day at the Zoo was obligatory as we wanted to see the new Pandas. The male one was not on show and the female one was fast asleep. She was cute but not as entertaining as the Penguin Parade which has sadly been suspended while their pool is being repaired. The family consensus was that we have officially now made our last zoo visit since we agreed that we don’t really like looking at animals through glass or rather, not seeing the animals because they are hiding. We enjoyed some great cafes and restaurants in Edinburgh. The Dome was delightfully opulent, Browns had wonderful polished brass tables, the mussels were superb at the Mussel Inn and the Hard Rock Cafe was simply cool. The Georgian architecture and cosmopolitan, busy streets certainly made a change from our usual surroundings. I had a productive weekend in my workshop. I utility-quilted a triangular quilt for a project that will feature in a forthcoming edition of P&Q Magazine, painted the reverse of the Norse bird with a roller to hide the fact that I drew the pattern out on an old sheet using a black biro and I have quilted two thirds of a new piece onto shot brown and orange taffeta that looks rather like Viking seaweed. There only remains one more piece until the “Ostrych” is complete yet I have two more shiny pieces of fabric and I have found a great source for plenty more. I think I may have missed the point of creating a series – perhaps all of the pieces should have been the same size or even the same pattern although I am sure that I would have become bored with the repetition. Maybe the next time I decide to tackle something like this I should PLAN to make a set of matching, small quilts! When I attempted to upload my weekly blog onto my website earlier this week I was horrified to discover that Blogware had ceased to exist and I no longer had access to any of my archives from the past four years. I frantically contacted Helen Bantock, my web-mistress, who had a long and fruitless discussion with the web provider, Fasthosts. They claimed that they had sent several warning emails advising me to move the blog to WordPress before Blogware became unavailable. Needless to say, they were unsympathetic when I informed them that I had no knowledge of any such correspondence so I made the decision to close my account with them. I probably should have done this some time ago since there have been several other occasions when blogs and emails have gone missing and the customer service team was not helpful. This all made me think quite profoundly of how transient our 21st Century civilisation could be to the archaeologists of the future. It just shows that we need to keep hard copies of what is important to us. 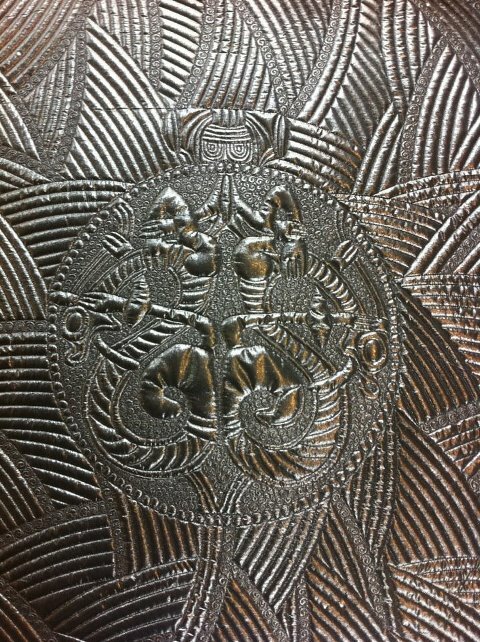 We only know so much about Humanity’s recent past due to scrolls, parchments, stone carvings and works of art. I have hundreds of photographs stored digitally but very few have been printed and displayed in an album. I love the power and scope of digital communication but I think I will invest in an archival box and fill it with old-fashioned paper documents. Much to her disgust our little black & white cat, Bitzi MacBob had to see the vet after regurgitating disgusting lumps of undigested rabbit. He was initially concerned that it might have been a tumour but luckily concluded she was suffering from an impacted colon. The solution was to squirt laxative solution into her tightly closed, hissing mouth. She looked a sorry sight with grubby, sticky fur all down her chin and she could have done with a bath but we were not going to add insult to injury. 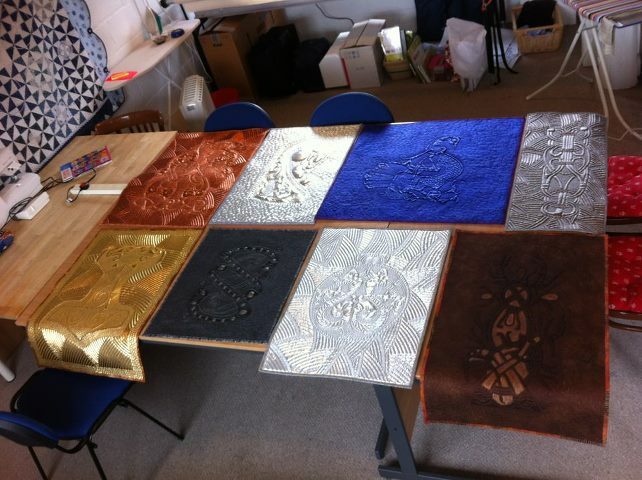 I attached bindings to the Norse Metallurgy quilts that have been completed so far. I added a fifth one in dark grey satin to the collection. 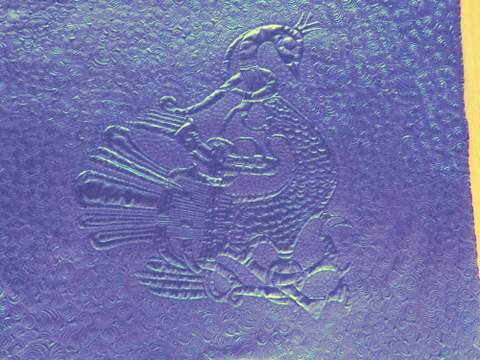 I followed this with purple silk lurex that is meant to be titanium and quilted a fantastical bird that seems to be some sort of Viking swan without webbed feet or a peacock minus a fancy tail. I need to try to decide when to end this series – I am a little concerned that I won’t know when to stop… perhaps I will feel the need to create Norse wholecloths celebrating the entire Periodic table using as many theatrical and shiny fabrics that I can find. I did not used to be able to figure out how or why some quilters and textiles artists produced an extended body of work but after working on two quilted Yurts, I seem to be developing an obsessive habit of making several related pieces. I am not sure yet how it will be displayed: Triptychs seem to be a popular idea so I wonder whether a series of 8 quilts might be an Octoptych or possibly an Ostrych? Although I had told myself to leave plenty of time to pack for my Yurt expedition to Newcastle, I ended up teaching in school for two days. After making up maps, stories and wrapping fake parcels for “Katie Morag” with Primary 3 I dashed home, loaded up the Landy then went to watch my own children’s marvellous school show. I am stunned by how well everyone sang and how many words and lines they all managed to remember. Fenella has brought her fantastic penguin costume home. Perhaps she might like to wear it on our trip to the Edinburgh Zoo next week? I had a clear run down to Gosforth Park Racecourse and arrived mid afternoon. The Yurt had to be unloaded, crammed into the goods lift of the catering kitchen and set up on the first floor of the grand main building. We managed to round up a few volunteers to get the frame and roof up and within a couple of hours I was satisfied that all was ready, although it was set into a corner as space was a little tight. My B&B accommodation was interesting… it looked cottagey from the outside but inside it was not so much “shabby-chic” as just well, shabby. The en-suite bathroom was brown and there was no wifi for an internet junkie. Being a typical Brit, I didn’t like to grumble. The lady cooking my breakfast was lovely and it seemed rude to buck the trend from all of the other delighted comments in the visitors’ book. I secretly enjoyed watching trash TV from a choice of two channels and drinking plonk out of a tooth-brushing glass but I shuddered when the milk in the little jug for tea went gloopy. I eventually plucked up the courage to tell the show organisers that I wouldn’t recommend it for future reference. It has to be noted that it has given me far more to write about than if it had been perfectly appointed. I do wonder about some B&B’s though. I reckon if I had one it would be perfect: quilts, decent showers, wifi, Gin & Tonic in a mini fridge, sewing machines and home baked bread! I really enjoyed the show – the people and traders were friendly, the setting was super and as a bonus there was the excitement of seeing some horse racing on two days. 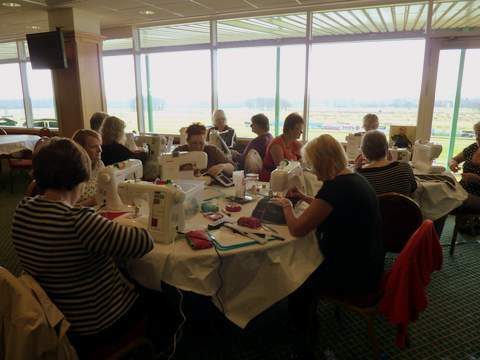 I taught several workshops including a circles journal quilt, free motion quilting samplers and a zipped cosmetics bag in an open plan area upstairs overlooking the race-course. There were other classes running alongside mine in crochet, rug-making and paper crafts. My students were very willing and all seemed extremely pleased with what they achieved. 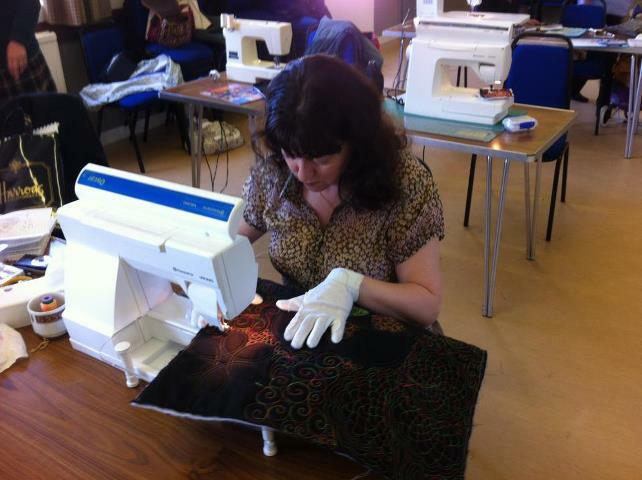 The brand new Janome machines on loan from the Singer Sewing Centre in Whitley Bay purred along very nicely. This generated a lot of interest in the local sewing machine shop and there were a few sales so by the end of the show I managed to persuade them to let me have a good deal on a Lady Valet dress-making dummy. I went on a jaunt to IKEA one evening to buy some cheap cushions for the Yurt. I bought some small ones for 80p each and a fleece blanket. I quickly ran up some very basic cushion covers with fringed edges in my makeshift studio. Typically, I also bought some useful random IKEA items such as a hard-boiled egg slicer, a silicone ice cube tray that produces novelty-fish-shaped chunks of ice and a spare set of pinking shears. It was pointed out to me by my landlady that there are quite a few footballers’ wives and girlfriends living in the Ponteland area which would explain the flash cars, Waitrose and some very tanned ladies with glamorous hair-dos. I went out for supper one evening with Crafting Angels, Jen and Rosemary from Broxden in Central Scotland. We had a good time, discussed a little business and enjoyed a spot of people-watching. Guiltily, I phoned home to wish Freya “Happy Birthday” but it sounded like she had a good time anyway. Tania provided her with a surprise birthday tea, she went to Bands Nite at the town hall, unwrapped lots of super presents and finished school for the Easter holidays.